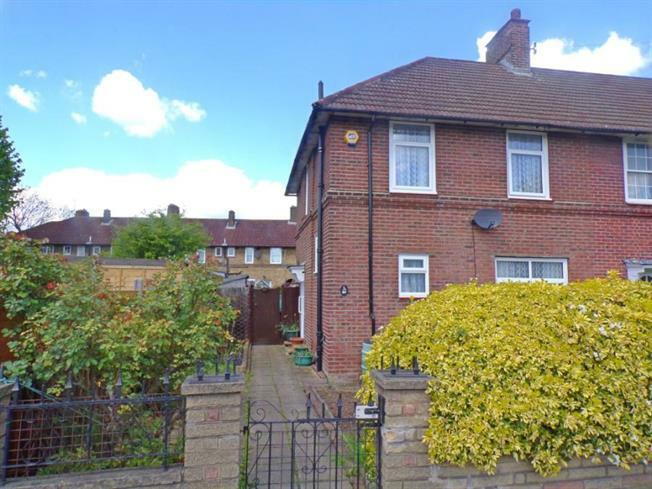 3 Bedroom End of Terrace House For Sale in London for Asking Price £400,000. Benefits include freehold, end terrace, three bedrooms, double glazing (where stated), gas central heating (untested by Bairstow Eves), spacious garden, side access to garden. Double glazed window. Gas fire, carpeted flooring. Double glazed window facing the rear overlooking the garden. Vinyl flooring. Wood work surface, freestanding units, stainless steel sink, space for, freestanding oven, space for washing machine. Double glazed window with obscure glass facing the front overlooking the garden. Single enclosure shower, wall-mounted sink. Double glazed window. Laminate flooring. High level flush WC. Double bedroom; double glazed window. Carpeted flooring. Double bedroom; double glazed window. Radiator, carpeted flooring.